Let us have a look at the B-rated (so: time a bit unsure) ADB-chart for Phil Collins and wonder what in the chart shows his talents and where in the chart the lost of sense in his fingers and hands are (this happened to him starting in 2007). (the prominent Sun is the symbol of the star). We see Moon trine Venus out of sign and Venus 127 d Neptune and also 127d Uranus. Venus is in opposition with the midpoint of Uranus and Neptune. Venus-Neptune is the combination for high sensitivity and art. Venus-Uranus is the combo for rhythm. Singers and pop musicians often have a Venus-Uranus and/or Venus-Neptune connection in the chart. I almost forgot to mention that Venus is ' calling' (no major aspects in sing!) and that the Moon is rising before the Sun, right after Neptune. That makes the artistic trio prominent. When Venus is calling, you can't resist the call for style, entertainment, fun, pleasure and beauty or...being artistic. Also, this B-rated chart has a Midheaven that is connecting Neptune (quintile) and Moon (square) and there is a quatronovile (160d) aspect with Venus. There is the trio again! So far for the artist in the chart. 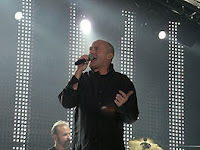 In 2007, during the last Genesis tour, it became clear that there was a medical problem, a dislocated vertebra in the neck. Operations followed. What indications are there in the chart? I see Progressed Midheaven inconjunct Mars (for loss of muscle/energy or having to give up working). Progressed Ascendant is inconjunct Venus, Progressed Venus square Midheaven, Transit Neptune sextile progressed Mars. Except for the last mentioned transit the indications are only valid for an AA-rated chart. There is one big indication for a sudden change: progressed Sun is square Uranus. And if the B-rated chart is correct, this sudden change went along with a difficult inconjunction of Mars. Mars happens to be important for someone who is hitting drums. That is because Mars is the symbol of striking, hitting and using tools.